Ahead Of Key Report, 2 Modestly Positive Signs On Jobs : The Two-Way There were fewer first-time claims for jobless benefits last week. And in May, companies announced fewer layoffs. On Friday, the latest day on unemployment and job creation are due. Economists expect to hear that the jobless rate last month was 7.5 percent, unchanged from April. The scene at a career fair in San Francisco on May 30. 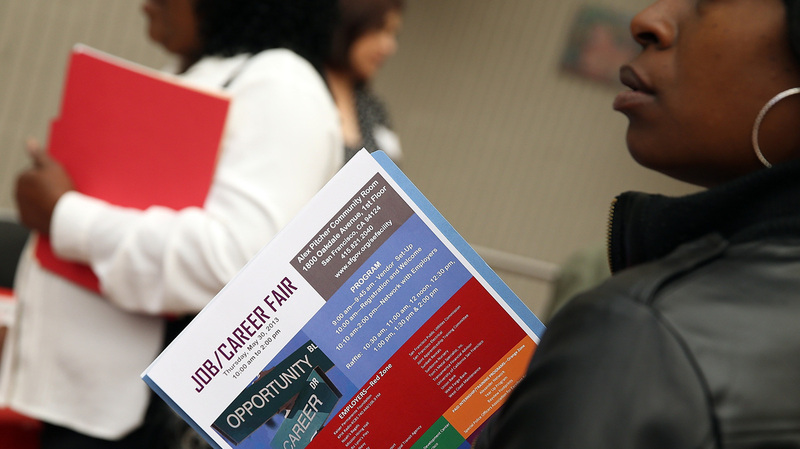 The number of first-time claims for jobless benefits fell by 11,000 last week from the week before, the Employment and Training Administration reports. There were 346,000 such applications. While on the positive side, the figure is still in line with the recent trend. Since late 2011, claims have basically stayed in a range from the mid-300,000s to just under 400,000. Also Wednesday morning, the outplacement firm Challenger, Gray & Christmas reported that "monthly job cuts declined for the third consecutive month in May, as U.S.-based employers announced plans to trim payrolls by 36,398 during the month, 4.5 percent fewer than 38,121 cuts in April. The May total was 41 percent lower than the same month a year ago, when employers slashed payrolls by 61,887." Those reports come a day before the week's most-anticipated economic news. Friday morning, the Bureau of Labor Statistics releases figures on the May unemployment rate and job creation. According to Reuters, economists expect to hear there were a net 170,000 jobs added to payrolls last month — modest growth, at best, for an economy with more than 155 million people in its labor force. They expect to hear that the unemployment rate held steady at 7.5 percent. If BLS does report there was a net gain in the number of jobs on private and public payrolls, that would not contradict Challenger, Gray & Christmas' data on layoffs. It's typical, when the economy is expanding, that even as some companies are shedding workers, more are adding them.